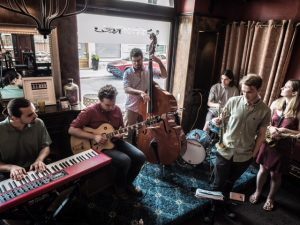 The Bill Kervin Quintet is comprised of young jazz musicians from North Bay and Guelph who have all been studying in Toronto at Humber College. The communication and interplay between all the musicians is a treat to hear. Between old standards, funk, and Latin styles anything can happen on stage. Come and support the local jazz scene with these wonderfully talented emerging musicians. Bill Kervin (drums), Aleida Budgeon-Strating (alto saxophone), John Kervin (keys), Simon Pequegnat (bass), Matt Morgan (guitar).